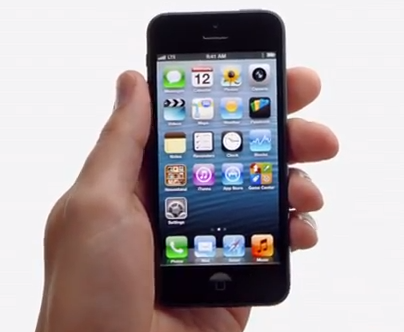 Apple has just started airing four new TV commercials for the newly launched iPhone 5. They have also been posted on the official Apple site and on their YouTube channel. Apple today announced pre-orders of its iPhone 5 topped two million in just 24 hours, more than double the previous record of one million held by iPhone 4S. The shipping date of the online orders as of today has been pushed back from 1-2 weeks to 3-4. Analysts have predicted iPhone 5 sales to exceed 8 million during the launch weekend, and a staggering 46.5 million by the end of this quarter. Coming to these newly released ads, the first one, ‘Thumbs’, shows how the taller display of iPhone 5 gives extra screen estate, yet keeping the same comfort of using it with one hand (thumb) like all the previous iPhone models. Introducing the iPhone 5, with 4-inch Retina display. It’s the perfect size for everything — including your thumb. Second one titled ‘Cheese’ shows off the new Panorama feature of Camera app in iOS 6, which by the way is also available on the previous generation iPhone 4S models running iOS 6. Now taking beautiful photos in panorama is as simple as saying "cheese". Third ad ‘Physics’ talks about how incredibly thin and light the new iPhone 5 is yet having a larger display and keeping the same (or even more) premium feel to it. The biggest and tallest yet somehow thinnest and lightest iPhone yet. Introducing the iPhone 5, with EarPods — designed to sound better and earshaped to fit better.